You may not be familiar with the three letters MSC – especially if you haven’t cruised before. Not so surprising, as MSC are a fairly recent newcomer to the cruise trade, having launched the cruise arm of the company in 1988 (previously having focussed on shipping trade). Their popularity, and success, has been phenomenal, and it is no surprise to me. Beautiful ships, full of Italian design and offering excellent value multigenerational family cruising for Continental Europeans and those of us who don’t hold the same boring old stereotypes about cruising that many Brits do (that cruising is only for the elderly, the wealthy and a dull form of travel). MSC offer relaxed smart casual, or semi-formal cruising on gala nights, with a great family focus. Unsurprisingly, they have a lowest average age of cruiser onboard compared to the cruise industry in general. 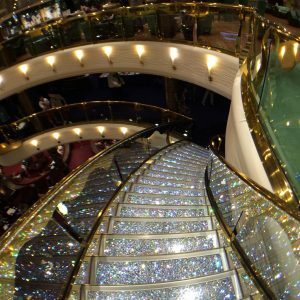 They also have these gorgeous Swarovski stairs on their ships. Don’t know if there is any correlation between the two.. certainly not traditional, just glamorous! On another slightly random note, one that cruisers of my generation or younger might appreciate. MSC do the best pizza on the seas. Hands down. I mean, who would even attempt to beat an Italian company when it comes to pizza? With all that, it really is no surprise that in very short time in trade terms they’ve reached a total of 15 ships(when counting this new arrival). 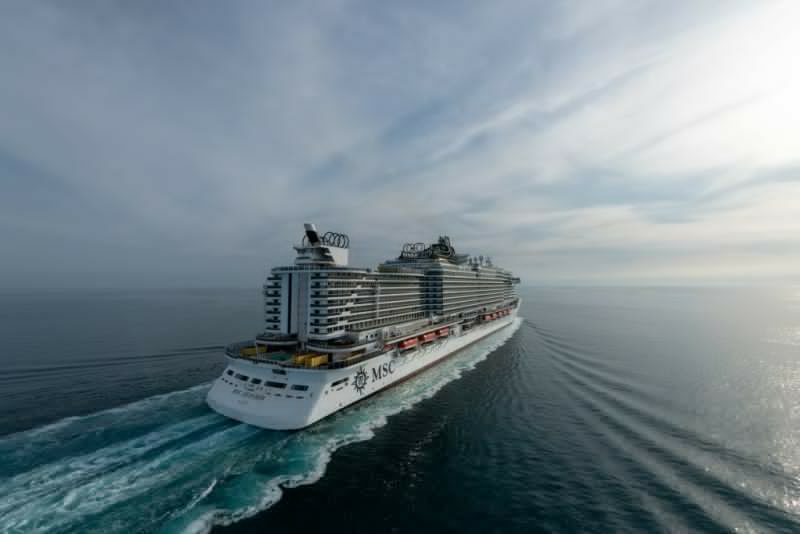 And there are more ships due, by 2026 MSC Cruises will have pretty much doubled their fleet in a decade – from 12 to 23. And hopefully they will be bringing even more young cruisers onboard with each new ship. Hopefully more vegans too! 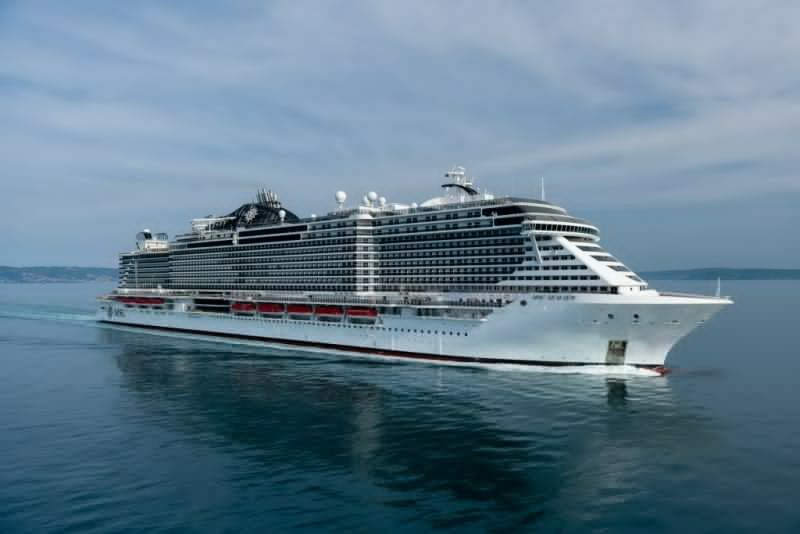 MSC Seaview is the latest ship to join the MSC fleet. 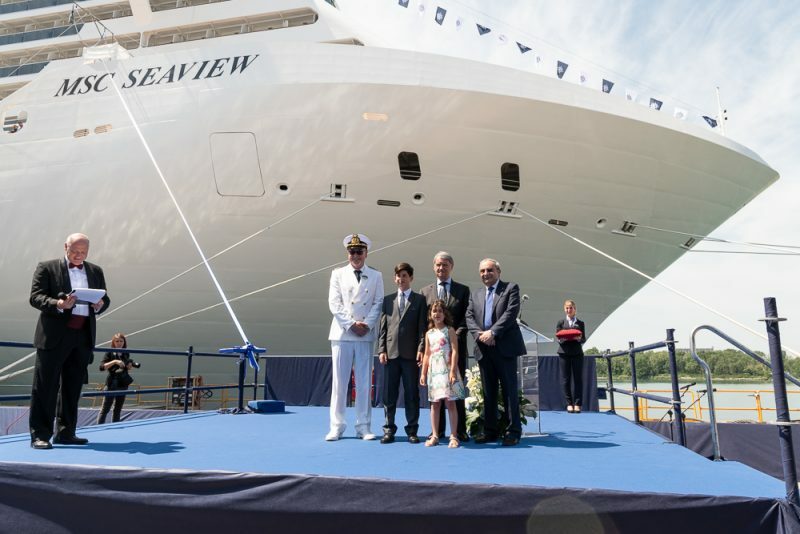 She was handed over today (June 4th, 2018) from the shipyards with a delivery ceremony and passed onto the care of Captain Scala and the MSC owner management. She’s currently on three-day sailing around Italy to Genoa for her inauguration on Saturday. She’ll be christened by Sofia Loren (ask your gran, if your mom doesn’t know) on Saturday night and will be joining her twin sister Seaside in the MSC fleet on Sunday, June 10th 2018. She’ll spend her summer on the Mediterranean before heading to South America for the winter. All that outside space is better suited for the sun than the Med in the winter. But aren’t we all? I would dearly love to sail Seaview as she’s bound to be as stunning, and as much fun as her sister Seaside, if not even even more so. I’m so wanting to try the zipline onboard. We’ve had teasers on social media, with some behind-the-scenes photos and videos by the charming Captain Scala.. but there’s still much to see/to be revealed. The two ships are sisters, but presumably not identical, much like other older MSC sister ships in the fleet. For some pre-inauguration info on her, check out Captain Scala’s Instagram photos and Insta Stories. For a better idea of what to expect, you can check sister Seaside’s CruiseCritic review. I especially love the look of her rear – that Miami South Beach art deco-inspired feel.. with promenade deck below with pool and much more. MSC Seaview not only a beautiful new ship in an ever-extending fleet, but she will be one of the greenest cruise ships on our seas. As a company, MSC have already won various awards for their recycling and environmental awareness but Seaview comes equipped with new innovative technology with massive environmental effect, or benefit rather. Features that save energy, reduce emissions, result in cleaner water emissions – outperforming many shoreside wastewater treatment units. MSC Fans website has a much detailed report on the technological advances here, detailing what valuable features have resulted in Seaview earning a RINA Green Star 3 classification. Naturally, as a vegan I can only applaud the work in making cruising a greener, more ecologically viable holiday form. 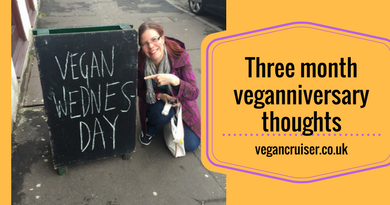 My journey to veganism started when I learnt about the strain of animal agriculture on our environment. Knowing I could cut my carbon footprint massively by going veggie I couldn’t continue to eat meat. Knowing I have greener ships to sail on, also makes me feel better about my love of cruising and ships. 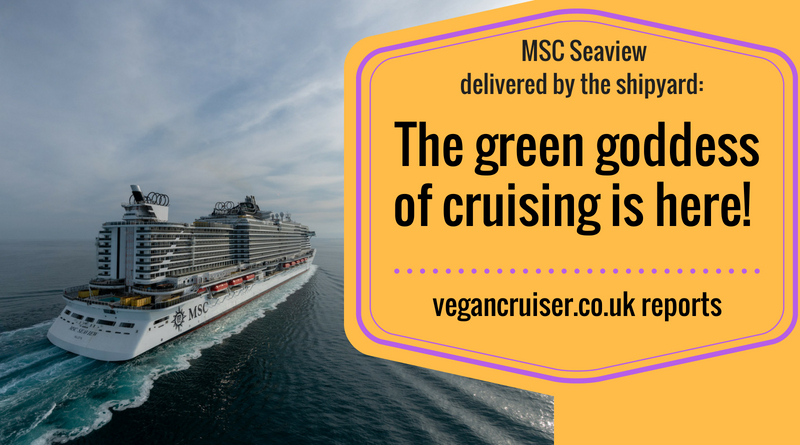 MSC Seaview a green vegan goddess? So not only is Seaview brand new, shiny and green in eco-terms, MSC have recently become much more vegan aware! I ate well in the buffet on an MSC ship back in 2016 (see blog post here) but in 2017 MSC included clearly marked vegan options in their dining room menus! 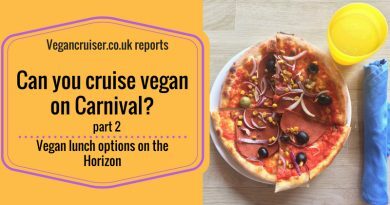 When Seaview’s sister Seaside was launched in late 2017 her inaugural celebrations included a separate vegan menu which fellow cruise blogger & journalist Dave Monk shared with me and the world on his Instagram. 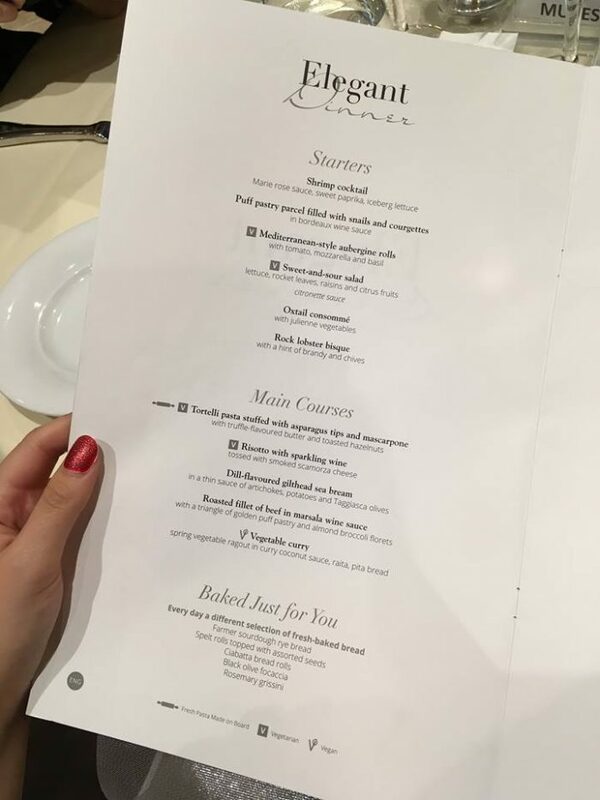 Back in October 2017 when I visited MSC Preziosa as part of a blogger event (see here) I also had a vegan main course on the lunch menu. 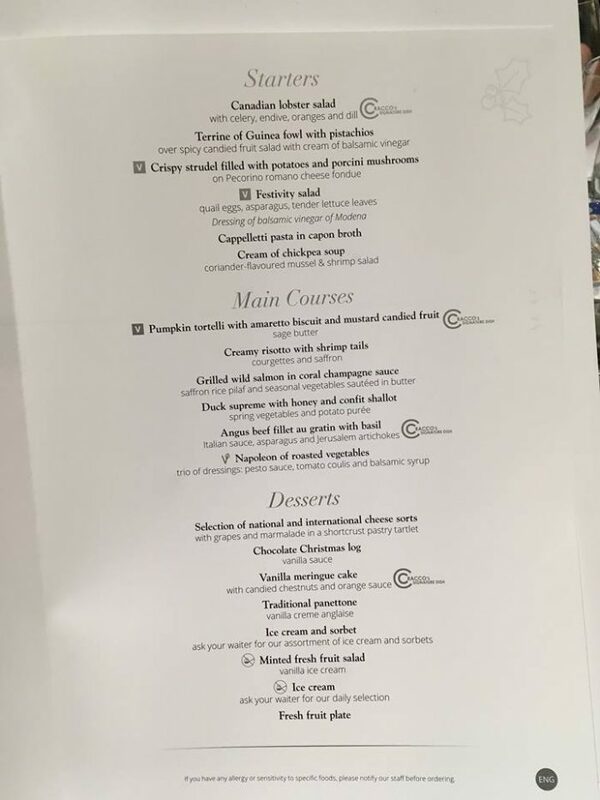 The ever so lovely EmmaCruises from Cruising Isn’t Just For Old People was onboard MSC Meraviglia at Christmas and sent me photos of vegan menu options on MSC. So promising to see real vegan choice on menus though I’m still waiting for vegan dessert on the menus. After all, Italy has epic vegan gelato. If you want to find out more about MSC Seaview, do follow MSC social media on Saturday for more info and footage on this gorgeous ship. I wonder if I will have anyone in Genoa to report on vegan options again? Hmm. Perhaps one day it’ll be me, reporting from Seaview.. one can wish. For sailings and pricing info, check out your national MSC Cruises website (UK and US links included). Many thanks for MSC Cruises UK PR team and photographer I Sarfatti for official photos. Thanks to Emma Leteace and Dave Monk for menu photos. 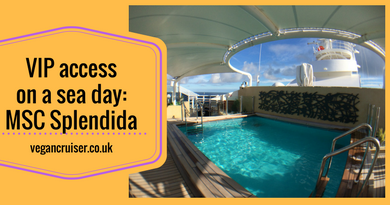 Behind the scenes tour on MSC Splendida: Yacht Club and more! I love how they have amazing choices for a vegan menu! The Swarovski stairs are incredible, I am determined to see those in my lifetime, bet it feels so glamorous walking down them! Roasted vegetable paella sounds sooo delicious, I’m so surprised that they have such good vegan options. I love that cruising is going green. 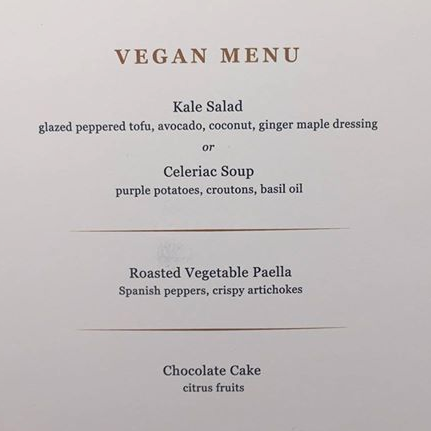 Someone actually tried to argue with me one time that cruising “isn’t in alignment with veganism” because of the carbon foot print… even though veganism is for the animals I know a lot of us are eco-conscious as well so that’s great  Also menu looks tasty but could get boring on a long trip? The square menu pic is just a set menu from the gala evening when the naming ceremony took place. The other larger menu photo (my friend holding it) is just for that night. Sure, it’s one vegan item in the menu but you can ask to be made something else instead. Otherwise menus are normally on a 14day rotation you won’t have the same dish twice.. unless you sail for three weeks or ask for something to made again. As for carbon footprint, I get that, but all travel is polluting, air travel too. So is driving cars. Modern ships use less fuel and filter out pollution so it is greener. But like you said, yes, we’re vegan for the animals and by doing that we already reduce our carbon footprint terribly.